Beautiful building – but ugly ceiling? 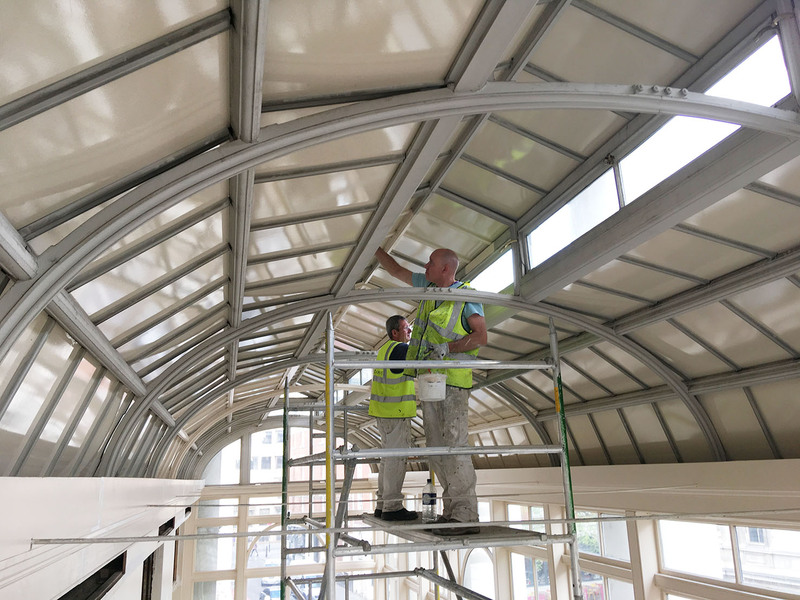 The roof of this prestigious bar and restaurant was fitted with glossy white plastic panels – fit for purpose but not very attractive and which stuck out like a sore thumb in this listed building. We installed a film to nearly four hundred rectangular panels – wrapping and tucking the flexible film around all four corners – so that the panels looked like they were originally made in the sand colour chosen to match the heritage paint used on the walls. And ridding the lovely building of its unfortunate and unsightly ceiling problem. The guys in the hiviz jackets are not Durable. We’d finished our bit and they just got in the way of the photo being taken. We think they were just having a really good look and admiring our handy-work.